The countdown to the biggest show of the year in pro wrestling is on. WrestleMania is to pro wrestling what championship games are for professional sports. No matter how may pay-per-views the WWE may hold in a year, WrestleMania is always the biggest. In counting down to the big event, I will take a look at my top five WrestleMania shows of all time. The criteria in determining the top five WrestleMania shows is a little complex. For one, I look at historical significance. The first WrestleMania is historic as the original and gets high consideration on that alone. Other WrestleMania shows may be historic for crowd attendance, availability, a particular point in wrestling history, matches, appearances, or a variety of other reasons. There are a lot of great matches from WrestleMania but only a few are considered the greatest. It is common for a terrible WrestleMania to be looked upon far more favorably years later due to one great match. One great match can make a WrestleMania and put the show in the history books forever. Star power is another big component in the mix. The power of the stars may be just as much about wrestling star power as it is power from the outside world. There is a big difference in a WrestleMania stacked with great stars as opposed to a show without a Randy Savage, Hulk Hogan, Roddy Piper, Steve Austin, The Rock, Bret Hart, etc. One WWE superstar doesn’t make a show, but a collection of stars is something that can truly make a WrestleMania special. 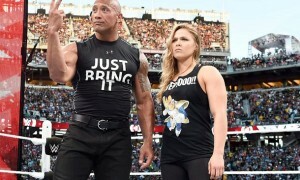 The legend of WrestleMania III gets stronger with each WrestleMania, growing by the year. It is no surprise that the show with the most replayed moment in WrestleMania history would rank on the list of all-time WrestleMania shows. WrestleMania III is a tale within a tale. The WWE continually brags about breaking records with 93,000 fans in attendance at the Pontiac Silverdome for WrestleMania III. The actual number of fans that attended WrestleMania II was 77,000 plus. The 77,000 fans is still a very impressive number of wrestling fans to attend a live show. However, the 77,000 number didn’t break any records which the 93,000 number did. WrestleMania III was truly the peak of the 80s boom for pro wrestling. To keep things in perspective, WrestleMania IV only drew 18,165 fans to Trump Plaza. The buy rate dropped from an 8.0 to a 6.5 for WrestleMania IV. It would be twenty-year before WrestleMania would draw over 70,000 fans for WrestleMania 23. Unlike the first two WrestleMania shows, this one was drawn on a wrestling match. The first show was drawn on Mr. T and Cyndi Lauper. The second one was potpourri of celebrities that included Ricky Schroeder and Tommy Lasorda. WrestleMania III had celebrities, but none compared to the phenomenon of the main-event. Hulk Hogan and Andre the Giant would headline the greatest WrestleMania of all-time. Make no mistake about it. Hogan and Andre drew the house. This wasn’t the first time that Hogan and Andre ever wrestled. As a matter of a fact, it wasn’t the first time that the two wrestled on a big WWF show. However, to a new generation of fans this was the ultimate dream match. Some will point to the day that Hogan beat the Iron Sheik for the title in 1984 as the day the angle started. In the post-match interview, Andre is seen celebrating with Hogan and a bottle of champagne. It may not have been an accident that this moment was replayed over and over again in the buildup to their match. An angle like this today would rarely work. 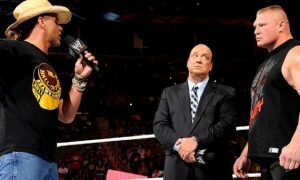 Fans would groan and Hogan would probably wind up being booed out of the building. There were no “cool” heels back then once Roddy Piper turned babyface. Hulk Hogan was the great American wrestling hero and Andre the Giant turned his back on his friend. Andre joined forces with Hogan’s enemy, Bobby “The Brain” Heenan. 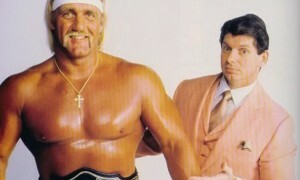 Under Heenan’s influence, Andre demanded a title match with Hogan. Hogan originally refused to fight his friend. The two had a confrontation on Piper’s Pit which resulted in Andre ripping off Hogan’s cross and bloodying his chest. Hogan had no other option at this point than to accept the match. It was a battle of good vs. evil. Hogan had been champion since 1984 and never had any serious threats for the title. Everyone knew Andre the Giant. How would Hogan do the unthinkable? It was the undefeated (in storyline only) Andre the Giant against the unbeatable Hulk Hogan. For the first time since winning the belt, Hogan seemed vulnerable and in jeopardy of losing his title. The match itself was nothing special. Andre was so physically disabled at this point in his career that he could barely move. The spectacle of 77,000 fans going nuts is amazing. The big moment in the match in which Hogan bodyslammed Andre is the most replayed moment in WrestleMania history. The end of what was actually a boring match came to an end at 12:01 when Hogan dropped the leg on Andre for a 1-2-3. WrestleMania III is remembered by a lot of fans for one of the greatest matches in WrestleMania history. A few years ago the WWE took a poll among its wrestlers for the greatest WrestleMania match. The Intercontinental title match between Ricky “The Dragon” Steamboat and Randy Savage was the runaway winner. That match has probably influenced more wrestlers than any other in WrestleMania history. Unlike Hogan-Andre, this match could take place tomorrow and steal the show. This was the fasted paced match in WWE history other than maybe the Tiger Mask-Dynamite Kid match from Madison Square Garden. The match was a constant back and forth between two athletes at the peaks of their careers. Steamboat beat Savage with an inside cradle (same move he beat Flair with for the NWA title) at 14:53. Steamboat was accompanied by George “The Animal” Steele and Savage was accompanied by the late Elizabeth. Second from the top in main-events would have been “Rowdy” Roddy Piper vs. the late Adrian Adonis. The fans always had a love/hate relationship with Roddy Piper. For the first time in WrestleMania history the fans cheered Roddy Piper. 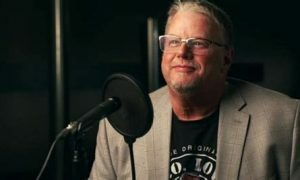 The match was advertised as Piper’s retirement match, although he wrestled for another twenty years following the show. Piper defeated Adonis with a sleeper in a hair vs. hair match at 6:54. Overall most of the matches don’t stand up today but the show is remembered as the greatest WrestleMania ever. Gene Okerlund recently said that Vince McMahon rolled the bank on WrestleMania III. Like the first WrestleMania, a bomb at the box office could have changed the course of wrestling history forever. That didn’t happen, but WrestleMania would never become bigger again. WrestleMania III is without a doubt the greatest WrestleMania ever. Rick Martel & Tom Zenk beat Bob Orton & Don Muraco when Martel pinned Muraco. Hillbilly Jim, Little Beaver, & Haiti Kid beat King Kong Bundy, Lord Littlebrook, & Little Tokyo via DQ. Harley Race pinned Junkyard Dog in a “loser must bow and kneel” match. Brutus Beefcake & Greg Valentine beat Jacques & Raymond Rougeau when Valentine pinned Raymond.